We have all experienced anxiety studying mathematics. Some go so far to call it math phobia. I experience anxiety when first grappling with a mathematical research problem. My anxiety, however, turns to excitement as I work on the problem and make progress towards its solution. I have an advantage that comes from years of experience: I can see the light at the end of the tunnel. With hard work and persistence, anyone can overcome anxiety and succeed in mathematics. Is there a difference in how the sexes experience math anxiety? The answer appears to be yes. Authors of the study: Gijsbert Stoet, Drew. H. Bailey, Alex M. Moore, and David C. Geary. 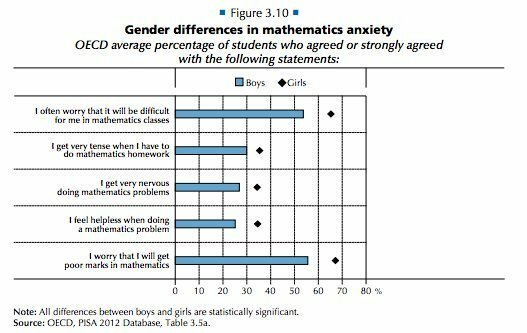 An insightful recent study by a group of education and psychology researchers discovered what many of us suspect: girls experience more anxiety towards mathematics than boys do. The team analyzed international survey scores of over 700,000 teenagers with ages between 15 and 16 across 68 nations. In more developed countries, overall math anxiety was lower, but there was a more prominent difference in math anxiety between the sexes. The survey data revealed that parents in developed countries put more value on mathematical competence of their sons over their daughters, despite more of their mothers employed in STEM fields. Responses to questions, stratified by gender, from the 2012 PISA survey. The researchers compared responses to these statements by both boys and girls. Sample data from the Stoet et al paper. There is no inherent reason why boys should be better at mathematics than girls are. Mathematics intrinsically has no gender. Mathematics has no color, not age, and has no sexual orientation or political persuasion. Mathematics is about patterns: recognizing them, generalizing them, and classifying them. Mathematics is about patterns. The figure is from a recent study using network theory to analyze characters in Game of Thrones. Like any other subject, however, mathematics is taught and studied by people. In that sense, mathematics conforms to all our societal and cultural norms, both good and bad. Our parents, peers, our teachers and professors, and even our politicians have influence over what and how we learn the subject. The math anxiety study described above should all make us pause. Really, it needs to be a wake-up call. Young women are still receiving the message that they are less talented in mathematics. Our culture is changing. We’ve seen enormous progress in the equality of women in recent decades not only in mathematics, but also in other areas of academia, in politics, the arts, sports, and every other profession. Women, simply put, are catching up. The time is now for equality. As our Prime Minister Justin Trudeau responded when asked about appointing women to 50% of his cabinet: it’s 2015 (it’s 2016 now, but you get the point). Some of the best mathematicians I know are women. In my field of graph theory, there are many brilliant thought leaders like Fan Chung Graham (check out last week’s blog), Maria Chudnovsky, and Jeannette Janssen. The gender gap in the mathematics community remains obvious though, and most mathematics departments have a noticeable gender imbalance. Part of the problem with mathematics education is cultural. Vanessa Vakharia is the founder and director of The Math Guru, which provides tutoring in math and science in my home town of Toronto. Vakharia maintains a great blog on education (especially gender issues) in mathematics and science, and she frequently lectures on the topic. Her Master’s thesis Peace, love, and pi: imagining a world where Paris Hilton loves mathematics gives you a sense of her background. Vanessa Vakharia, founder/director of the Math Guru. I heard Vanessa give an inspiring lecture at Ryerson University last year on the issue. I learned from her lecture about the Forever 21 controversy, where the brand sold clothing for girls with anti-math slogans. There are plenty of other negative reinforcements of math like this clothing and toys, ranging from a “I’m too pretty to do homework” shirt from JCPenny, to Barbie saying “Math class is tough!” when you pull a string. 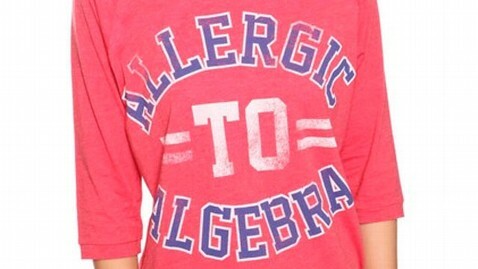 A Forever 21 t-shirt aimed at teen girls. Our young women are taught from an early age even through the clothes they wear that they are either not as good at math as their male peers. I don’t have all the answers about to address the issue of math anxiety in girls. However, as I have espoused a number of times from my blog, I think we need a cultural shift in the way we think about the subject. There is much we can do right now. First, a caveat. We need to acknowledge, unequivocally, that the sexes are equally talented in mathematics. Educators play a role. We need to encourage girls and young women to study mathematics, and that must be heavily promoted in our schools and universities. Engagement. We need more mathematics engagement activities (think math clubs, competitions, seminars) targeted at young women. Scholarships targeted at young women in math are especially welcome. Parents play a big role. Parents need to start positive reinforcement of math education early, and let their daughters know they can be just as successful in mathematics as their sons. Encourage your daughters to study math and science. Young girls need to hear that is OK for them to excel in these fields, and it in no way makes them less feminine. The medium is the message. We need to read, see, and hear stories about women mathematicians. There is a need for more books, blogs, and movies about them. The gifted algebraist Emmy Noether (1882-1935). Anyone from Hollywood out there reading this? There are great, compelling stories about women mathematicians just waiting to be told. The Ramanujan biopic, in wide release soon. 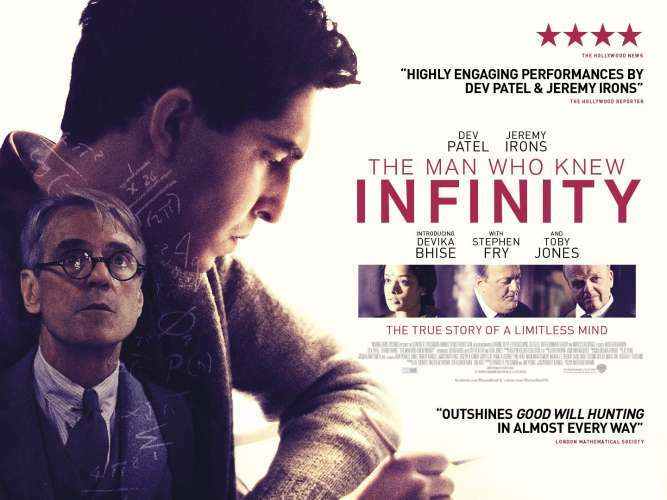 We’ve had recent biopics about Srivinasa Ramanujan, John Nash, and Alan Turing. We now need to celebrate the brilliant women mathematicians out there, such as Emmy Noether, Julia Robinson, Vera Sós, or the recent Field’s medalist Maryam Mirzakhani. 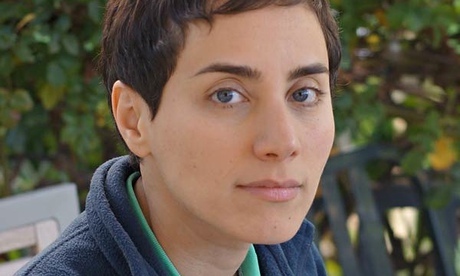 Maryam Mirzakhani (Stanford), the first woman to win a Fields Medal in 2014. Mathematics must be a subject that is equally accessible to all. That message needs to reach all young women studying mathematics. Next Post Is mathematics an art or science?